Rebecca Solnit is my new literary crush. I’ve just (and I mean just, as in right now) finished Wanderlust: A History of Walking. 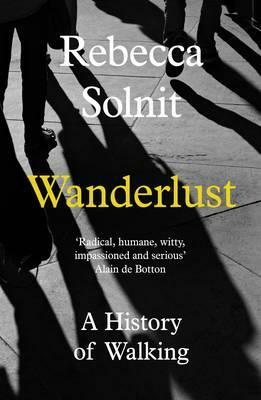 Although she does talk about her own walks, it’s not a book about the author’s walking – like Robert MacFarlane’s – and though it is at times personal, Solnit draws on an exciting and mind-blowingly diverse range of sources and subjects. The tour takes in evolutionary theories, ancient Greek philosophers, English Romantic poets, Jane Austen’s Elizabeth Bennet, the industrial cities and affluent suburbs of 19th century England, mountaineering and hiking clubs in America and Germany, ramblers in Britain, right-of-way protests, America’s car-centric, anti-pedestrian cities and suburbs, how a woman walking is a sexual provocation, strolling The Strip in Las Vegas – and more. Her activist politics shine. Walking’s not just a means of transport – it’s a pleasure, a solace, an inspiration. You see the world (or at least, your neighbourhood), you meet people, you breathe and move and think at a human pace. All the ways of walking! Stride, hike, stroll, meander, dawdle, saunter. I walk most days, most often with my little dog Gus, and usually a 40-minute loop of our local Botanical Gardens. Gus adds multiple diversions for weeing and sniffing to my routine, but that’s OK; I’m a slow walker. I used to go bush-walking with my oldest brother and at times we’d be a couple of kilometres apart, because he’s a strider and I’m a meanderer. I like to look at things. I don’t like to hurry. I have thought about getting another bike (my ancient and very heavy mountain bike recently went to the Op Shop) but do I really need to get anywhere quicker? The multiplication of technologies in the name of efficiency is actually eradicating free time by making it possible to maximize the time and place for production and minimize the unstructured travel time in between. New time-saving technologies make most workers more productive, not more free, in a world that seems to be accelerating around them. Too, the rhetoric of efficiency around these technologies suggests that what cannot be quantified cannot be valued – the vast array of pleasures that fall into the category of doing nothing in particular, of woolgathering, cloud-gazing, wandering, window- shopping, are nothing but voids to be filled by something more definite, more productive, or faster paced… The indeterminacy of a ramble, on which much may be discovered, is being replaced by the determinate shortest distance to be traversed with all possible speed, as well as by electronic transmissions that make real travel less necessary. I’ve just bought On Looking by Alexandra Horowitz, which sounds as if it may share some territory with this book.